(Spoilers ahead for last night’s “Game of Thrones” finale.) As the current election cycle and Brexit seem so keen to remind us, these are especially contentious political times. 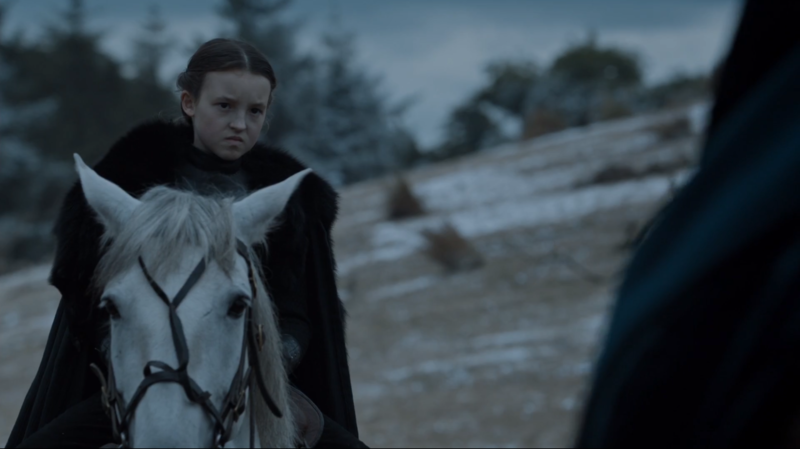 Whatever our real-world quibbles, however, “Game of Thrones” gave us all a leader to believe in this season: Lady Lyanna Mormont of Bear Island. Young rulers aren’t uncommon in Westeros, but the sadistic King Joffrey and his younger brother Tommen (R.I.P., and way to make “King’s Landing” take on literal meaning) didn’t inspire a fraction of the confidence that this 10-year-old girl did. In what couldn’t have been more than 15 minutes of screentime across three episodes, Bella Ramsey’s take on the diminutive Lady emerged as a fan favorite. We first met her just a few short weeks ago, when the newly reunited Jon and Sansa were in coalition-building mode as they sought to reclaim their ancestral home of Winterfell. Support for their once-great house was scattered in the wake of the War of the Five Kings, which ended disastrously for the North and resulted in many lost lives, but Lady Mormont answered the call in a way that instantly endeared her to all. After proving herself to be the sultan of sass (“Lady Sansa is a Bolton — or is she a Lannister? I’ve heard conflicting reports”) and making it clear that she’s wise beyond her years, the precocious ruler did what countless others on “Thrones” have failed to do: saw the bigger picture. Winter is coming, she was told, as are the White Walkers, and so she put aside her differences and pledged all 62 of her men (who fight with the strength of 10 mainlanders, natch) to the cause. Think about that for a moment. How many others have failed (and usually died) because they couldn’t see the forest for the trees? More than one Stark, Stannis Baratheon, Oberyn Martell, even Jon himself. (He got better.) Lyanna listens to her maester when appropriate, sure. Crucially, though, she gives him the hand when Jon, Sansa and Davos put their cards on the table and decides what needs to be done all on her lonesome. There’s also the fact that Ramsey has never acted before. If there’s any justice in this world — which, like Westeros, there usually isn’t — then she’ll be the biggest movie star in the world by the times “Thrones” returns next spring. Failing that, let’s hope her role is expanded. This show can be so monumentally upsetting that a genuinely inspiring presence is like a tonic. It’s also worrying, as the showrunners now know that Lady Mormont has attained fan-favorite status — as last night’s “The Winds of Winter” demonstrated more than any episode before it, they have a habit of eliminating all nonessential personnel. That this character came about in the midst of a circus-like presidential election and one of the UK’s most significant political events in decades is a coincidence, but a happy one. The world needs a hero, and if that hero happens to be a fictional character on a high-fantasy TV show, so be it. The North remembers, and so will we.